Off position (knob all the way in) cuts off all 1959 Buick lights controlled by the switch. Parking position (knob pulled out to first notch) turns on the 1959 Buick parking lights, 1959 Buick tail lights, and 1959 Buick license light and key light. The 1959 Buick instrument panel lights also will be turned on if the rheostat is set for these lights. Driving position (knob pulled out to last notch) turns parking lights off and turns headlights on, while the other lights remain as in the parking position. The headlights will be on the upper or lower beams depending on the position of the separate dimmer switch. In the parking and driving positions, the 1959 Buick instrument panel lights are controlled by rotating the light switch knob. With the knob turned counterclockwise, these lights are on maximum brightness. As the knob is turned clockwise, they gradually dim until they are off at the full clockwise position of the knob. Dome light position (knob turned fully counterclockwise) turns the dome light on. The dome light can be turned on regardless of the in-or-out position of the switch. 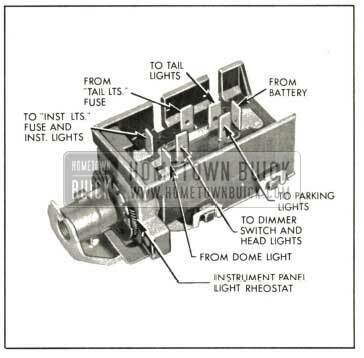 A thermo circuit breaker is incorporated in the 1959 Buick lighting switch assembly, to protect wiring from damage due to short circuits in the 1959 Buick headlight and front parking light circuits only. 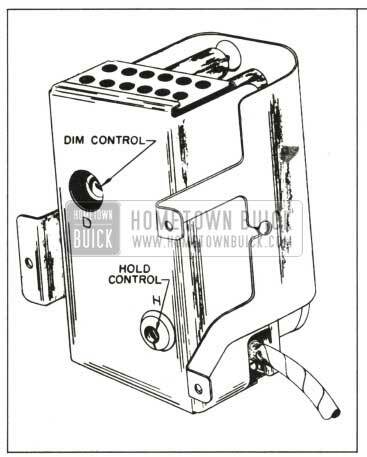 The thermo circuit breaker consists of a bi-metal blade and set of contact points connected in series with the 1959 Buick lighting circuits. An abnormal flow of current through the circuit breaker, such as would be caused by a short circuit in a lighting circuit, heats the bi-metal blade sufficiently to separate the points and cause them to vibrate. The vibrating blade alternately opens and closes the circuit, thus reducing the flow of current and protecting the wiring against overheating and burning. The flickering light produced by the vibrating circuit breaker serves as a warning to the operator of vehicle that a short circuit exists. If the 1959 Buick lighting switch is suspected of being faulty, the contacts can be tested by connecting a low reading voltmeter between the wire supplying current to the contact and the wire conducting current away. This must be done with the switch in a position where the contact under test is closed. See Figures 10-50 and 10-93. In order to gain access to the 1959 Buick headlight switch, remove lower left instrument panel housing. 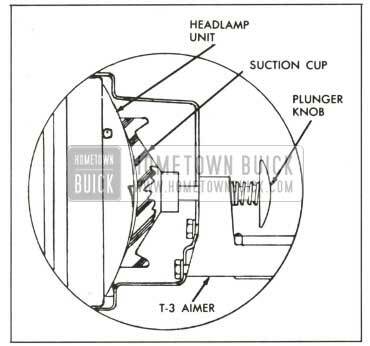 To check the switch contact for the 1959 Buick headlights, pull switch knob out to last notch and also make sure dimmer switch is in upper beam position. Connect voltmeter prods between battery and headlight terminals of switch (between red and yellow wires) . If voltage loss through switch contacts is over .2 volt, switch must be replaced. To check the contact for the 1959 Buick tail lights, connect voltmeter between tail lights and tail light fuse terminals (between gray and black wires). If voltage loss is over .1 volt, switch must be replaced. To check the contact for the parking lights, put switch knob in first notch position. Connect voltmeter between battery and 1959 Buick parking light terminals (between red and white black stripe wires). If voltage loss is over .1 volt, switch must be replaced. 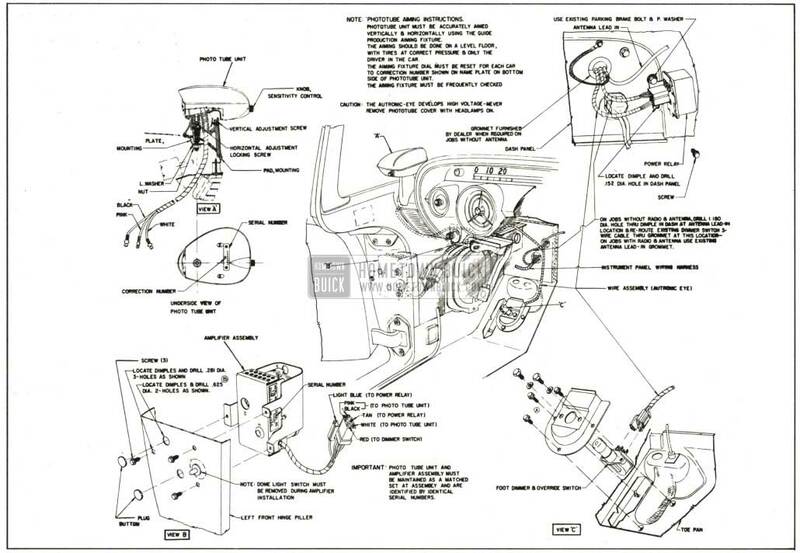 Remove lower left instrument panel housing. Unplug multiple connector from 1959 Buick lighting switch. Pull switch knob out to last notch, then depress the spring loaded latch button on top of switch, while pulling knob and rod assembly out of switch. NOTE: If latch button is depressed before switch knob is pulled out, knob and rod assembly will not release. Remove switch mounting nut with Wrench J-7799 and remove switch from instrument panel. Reconnect battery ground cable in manner to properly wind clock and set clock. See paragraph 10-56. To test the 1959 Buick thermo circuit breaker, remove lighting switch from instrument panel to avoid possible damage to adjacent instruments. Connect an ammeter and a carbon-pile rheostat in series with the battery terminal of 1959 Buick lighting switch and positive terminal of a 12-volt battery, and set rheostat to provide maximum resistance. Rheostat must have capacity for 50 amperes and be adjustable down to .3 ohms. See figure 10-50. With switch on, connect the 1959 Buick headlight terminal of lighting switch and the negative post of battery. Adjust rheostat to give 26 amperes. The circuit breaker should open within 60 seconds. Adjust rheostat to give 15 amperes on ammeter. The circuit breaker should remain closed indefinitely at 15 amperes. If circuit breaker does not operate as specified the 1959 Buick lighting switch assembly must be replaced since internal repairs cannot be made. 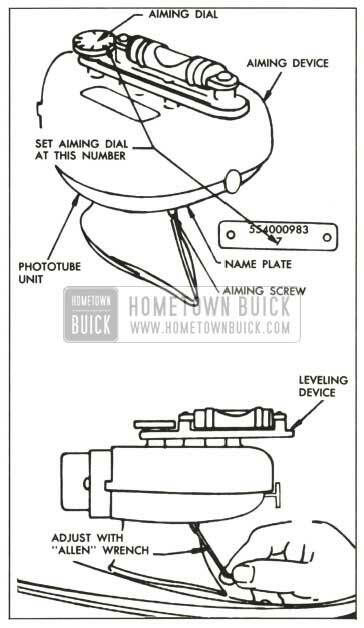 The 1959 Buick dual headlamp system is standard equipment on all series and consists of two dual headlamp assemblies, one mounted on each side of the car. Each dual headlamp includes two 5 3/4″ T-3 sealed beam units mounted in a single housing enclosed by one headlamp door. The inboard unit is used for bright lights only and has a single filament. The outboard unit is used for both bright and dim lights and has two filaments. For identification, the inboard unit is marked “1,” the outboard unit is marked “2”. When the dimmer switch is in the dim or lower beam position only, the outboard (type “2”) unit of each dual head lamp is on. Both outboard (type “2”) and inboard (type “1”) units of each dual headlamp are on when the dimmer switch is in the bright or high beam position. The T-3 sealed beam unit has three projections equally spaced around the perimeter of the lens. These projections are ground off at the factory to provide a mounting surface for aiming devices. These aiming devices are used without switching headlights on as described below (par. 10-48, d). 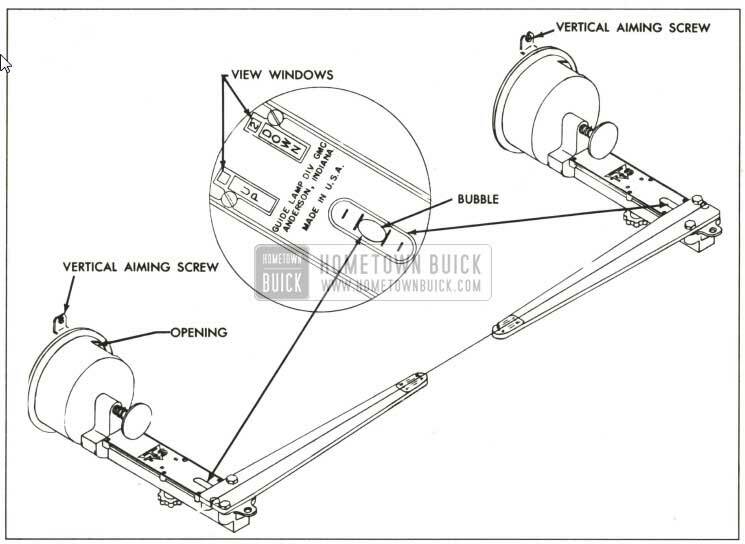 The 1959 Buick dimmer switch opens and closes the circuits to the upper and lower lamp filaments in both sealed beam units, thereby alternately raising and lowering the 1959 Buick headlight beams with each successive operation of the switch. Depression of switch button turns the rotary contacts one position within the switch. The spring-loaded button automatically returns to the reset position when released. The wiring connection to the dimmer switch is made by a multiple connector. The dimmer switch is mounted on the inner side of the toe pan, so the switch, connector and wiring are all inside the car. Whenever the upper headlight beams are lighted, a beam indicator bulb on the instrument panel also lights, producing a small spot of red light in front of the driver. For safety reasons, he should never pass an approaching car with the beam indicator showing red. When a 1959 Buick sealed beam unit is burned out or broken it must be replaced as a unit assembly. Remove 1959 Buick headlamp door by loosening four captive screws. Unhook the spring from retaining ring, then remove sealed beam unit and retaining ring assembly, being careful not to disturb the two beam adjusting screws. Pull the wiring connector from the sealed beam unit. Remove two screws fastening retaining ring to mounting ring. Remove retaining ring and sealed beam unit. Install new sealed beam unit by reversing removal procedure. Position lens with the “1” or “2” up. The reflector has three lugs which fit into notches in the headlamp mounting ring. CAUTION: Make sure that sealed beam unit is marked “1” for an inboard unit or “2” for an outboard unit. The 1959 Buick headlamps must be properly aimed in order to obtain . the maximum road illumination and safety that has been built into the head lighting equipment. With the Guide T-3 type sealed beam units, proper aiming is even more important because the increased range and power of this new lamp make e1,en slight variations from recommended aiming hazardous to approaching motorists. 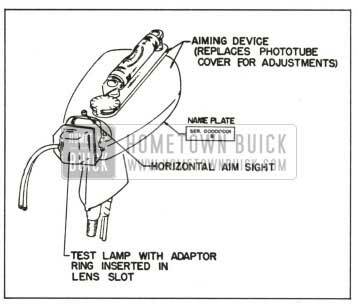 The 1959 Buick headlamps must be checked for proper aim whenever a sealed beam unit is replaced and after any adjustment or repairs of the front end sheet metal assembly. Regardless of method used for checking headlamp aim, car must be at curb weight, that is, with gas, oil, water, and spare tire, but no passengers. Tires most be uniformly inflated to specified pressure (par. 1-1). If car will regularly carry an unusual load in rear compartment, or a trailer, these loads should be on car when headlamps are checked. Some states have special requirements for headlamp aiming adjustment and these requirements should be known and observed. Horizontal and vertical aiming of the headlamp beam is provided by the two beam adjusting screws which move the mounting ring in the body against the tension of the coil spring. There is no adjustment for focus since the sealed beam unit is set for proper focus during manufacturing assembly. The Guide T-3 Safety Aimer makes it possible to precision-aim the 1959 Buick dual headlamp system in a minimum amount of time and space and to check the aim of the headlamps without removing the headlamp doors. No screens or other aiming equipment are needed and aiming can be accomplished in daylight or darkness without the headlamps turned on. An average stall is all that is required since only sufficient room is needed for a man to walk around the car. A stall with a level floor is preferred so that aimer can be used just as received from the factory without being recalibrated. The T-3 Aimer comes from the factory with level bubbles accurately set and instructions for rechecking the level accuracy after aimer has been in use. It is important that these instructions be followed when aimer is received and before it is used, as a precaution in case aimer is dropped or damaged. The aimer can be used in selecting an area for headlamp aiming and can be calibrated to compensate for uneven floors. The procedure for checking and adjusting headlamp aim is the same on all cars, whether coil spring or air ride equipped. The Guide T-3 Safety Aimer for the left-hand dual headlamp is shown in figure 10-51. NOTE: It is not necessary to remove headlamp doors to check headlamp aim. Drive the car onto the selected aiming area. IMPORTANT: For an accurate headlamp aim the floor must either be level or else the T-3 Safety Aimer must be calibrated for the selected aiming area in accordance with instructions received with aimer. Once the aimer is calibrated for an unlevel floor, all future aimings MUST be made with cars placed on the same area faced in the same direction. Mount the T-3 Safety Aimers on each of the inboard units (type “1”) so that the lamp guide points engage smooth inner ring of aimer and the arm on each aimer points toward center of car. Secure Safety Aimer to each headlamp unit by pressing plunger knob firmly, Rotate arm to approximately horizontal position. See Figure 10-52. With aimers in place, position the knots on each end of the elastic string in the slots provided on both aimers. Car doors must be closed and car rocked gently sideways to equalize springs. prior to checking and adjusting headlamps. See Figure 10-53. 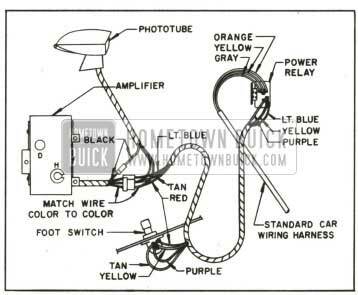 Rotate aimers around headlamp units so that the scale on each aimer just clears the string. For aiming both inboard (type “1”) ‘and outboard (type “2”) units, loosen level calibrating knob and slide knob rearward or forward until numeral “2” appears in DOWN view window. Tighten knob of the aimer. All future checking and adjusting of headlamp aim will be done with aimer calibrated with numeral “2” in DOWN view window. The string should cross between right and left line “2” on scale of aimer. If the string does not fall within these limits it is necessary to adjust horizontal aim using procedure in subpar. h.
Check horizontal aim of other type “1” unit as instructed above. The bubble should be within the two outside line s of the level on the aimer. If bubble in level does not fall within these limits it is necessary to adjust vertical aim using procedure in subpar. i. Check vertical aim of other type “1” unit as instructed above. Remove aimers by pulling on the suction cup tabs through opening in aimer. Mount the aimers on each of the outboard units (type “2”) and check head lamp aim of the type “2” units as instructed in above sub. pars. d, e and f.
Remove the 1959 Buick headlamp doors and replace any defective unit. Mount T-3 aimers on Type “1” units as instructed in subpar. c above. 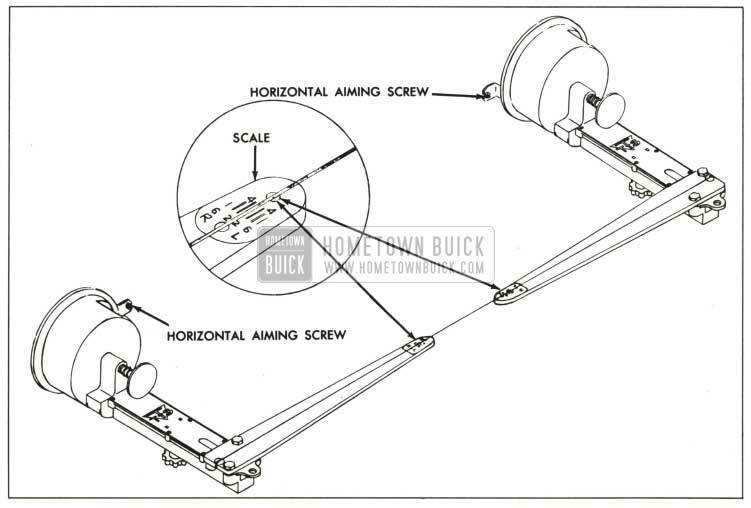 Turn horizontal aiming screw on left-hand unit until the string is positioned directly over the center line of the scale on the left-hand aimer. Turn screw clockwise in making final adjustment to take up play in the headlamp mechanism. See Figure 10-54. Repeat the same operation on the right-hand unit to position the string directly over the center line of the scale on the right-hand aimer. Turn 1959 Buick headlamp vertical a1mmg screw counter-clockwise until the bubble in level is at the end of vial toward headlamp unit. Then turn screw clockwise until bubble is centered in the level. See Figure 10-55. Repeat Step 1 on the other headlamp unit. Recheck the position of the string on the scale of the aimers, and the bubble in the levels. Remove aimers by pulling on the suction cup tags through opening in aimer and mount aimers on the outboard units (type “2”) and adjust as instructed in above subpars. d, e, and f to complete headlamp aiming procedure. Install headlamp doors. The 1959 Buick Autronic-Eye is an electronic device that automatically switches the headlamps between the upper and lower beams in response to light from approaching cars. The electrical power to operate the 1959 Buick Autronic-Eye comes from the headlight terminal of the regular light switch and it is therefore energized whenever the light switch knob is pulled fully out. Overload protection is provided by the regular thermo circuit breaker in the light switch. The 1959 Buick Autronic-Eye consists of four separate units: a power relay, a combination dimmer override foot switch, an amplifier, and a phototube. See figure 10-56. The power relay, mounted in the engine compartment, is a heavy duty relay which switches the headlamps between the upper and lower beams. It switches the 1959 Buick headlamps to the lower beam when the relay control signal from the amplifier is of sufficient strength to actuate the relay (this circuit goes to ground in the relay) . See figure 10-66. When the signal from the amplifier is too weak to actuate the relay, a spring in the relay switches the headlamps to upper beam. 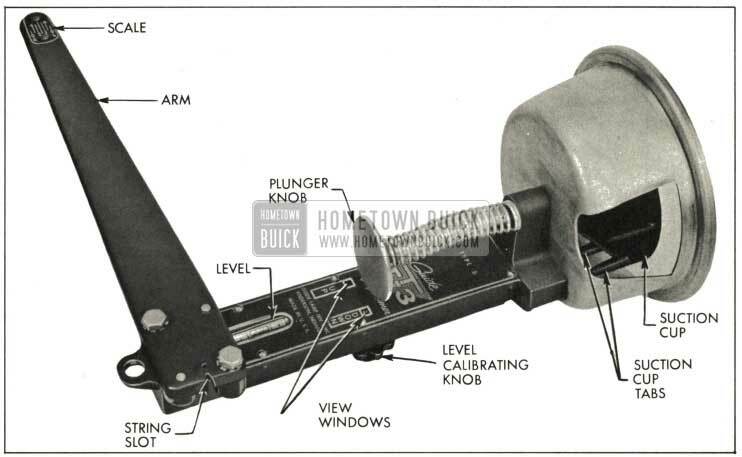 The 1959 Buick foot switch, mounted on the inner side of the toe pan at the far left, has two ratchet positions plus a special override section. The two regular positions are automatic and lower beam. The headlamps are controlled by the 1959 Buick Autronic-Eye in the automatic position only; in the lower beam position, the headlamps are mechanically locked on the lower beam. See figure 10-66. The override section of the foot switch functions only when the switch is in the automatic position. A slight pressure on the top of the switch provides upper beam, regardless of the amount of light on the phototube. Upper beam is obtained by temporarily grounding the amplifier signal inside the foot switch; with no signal available for the power relay control circuit, the relay switches to upper beam. This arrangement permits signaling, if desired, and provides a simple test for the automatic position of the foot switch. The amplifier, mounted on the forward side of the left front door hinge pillar behind the kick panel, supplies voltage to energize the phototube. It receives and amplifies any signal from the phototube. If the signal is weak, the amplifier signal to the power relay control circuit is correspondingly weak and the relay will not be actuated; if this signal is strong, the amplifier signal to the power relay is also strong and the relay will be actuated. The phototube, mounted on the top left side of the instrument panel, is energized by voltage supplied by the amplifier. It is an optical device which picks up light from ahead of the car and converts this light into an electrical signal which is supplied to the amplifier. The sensitivity of the phototube is adjusted to compensate for the different amount of light coming through a clear or a tinted windshield. A driver sensitivity control, located at the rear of the phototube, provides the driver with a limited sensitivity adjustment. See Figure10-57. In the automatic position of the foot switch, the 1959 Buick Autronic-Eye provides completely automatic switching of the headlamp beams. 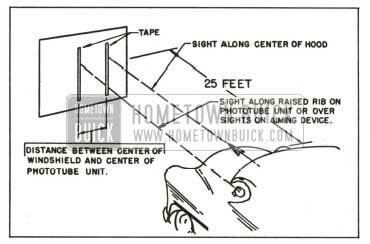 When a car approaches within proper distance, light from its headlamps striking the phototube causes the 1959 Buick Autronic-Eye to switch the headlamps to the lower beam. At this time, if the approaching car’s headlamps were on upper beam, the driver would normally switch to lower beam which would greatly reduce the amount of light striking the phototube. The Autronic-Eye is designed to hold its vehicle headlamps on a lower beam even with this reduction in light. When light is removed from the phototube, the Autronic-Eye returns the 1959 Buick headlamps to upper beam. If the approaching vehicle fails to switch to lower beam, the override section of the foot switch may be operated to provide an upper beam for signaling purposes. Street lights and other lights encountered in the city are sufficient to cause the Autronic Eye to hold its vehicle headlamps on lower beam. The 1959 Buick Autronic-Eye is disconnected from its vehicle headlamps in the lower beam position of the foot switch; however, the Autronic-Eye is not turned off. It continues to function as long as the headlamps are turned on, and is ready at all times to provide automatic control whenever the foot switch is returned to automatic position. 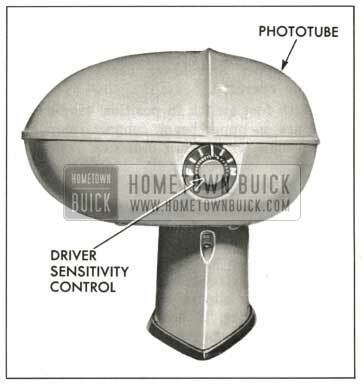 A driver control or sensitivity control knob is located at the rear of the phototube. This control gives the driver of the car a certain amount of control over sensitivity. A detent position (knob pointer straight up) is provided for normal sensitivity. Rotating the knob so that “F” is up increases sensitivity, causing the headlamps to switch to the lower beam when an approaching car is farther away than normal. Rotating the knob so that “N” is up decreases sensitivity, causing the headlamps to switch to the lower beam when an approaching car is nearer than normal. 1959 Buick Headlamps switch to the lower beam when an approaching car is too far away. Headlamps switch to the lower beam when an approaching car is too close or will not switch to the lower beam at all. Headlamps will not return to the upper beam when no car or other lights are ahead. Headlamps return to upper beam when the approaching car switches to lower beam. 1959 Buick Headlamps switch rapidly back and forth between upper and lower beam. Pull the light switch knob to full ‘.’On” position. After a few seconds warm-up time, the lights should remain on the lower beam, regardless of the position of the foot switch. Lightly depress the foot switch. The headlamps should switch to upper beam (as shown by upper beam indicator) if the foot switch is in the automatic position. If not, trip the foot switch and again depress to the override section. The lights should now switch to the upper beam. 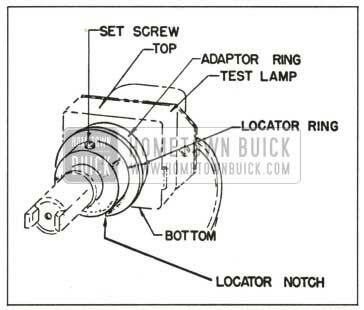 When the override section of the foot switch is released, the 1959 Buick headlamps should return to the lower beam. Cover the phototube lens tightly with a folded cloth. If the foot switch is in automatic position, the headlamps should switch to the upper beam. When hand is removed, the headlamps should switch back to the lower beam. If the 1959 Buick headlamps operate as explained in the above checks, the Autronic-Eye should operate correctly after making the adjustments as described in subpar. d below. 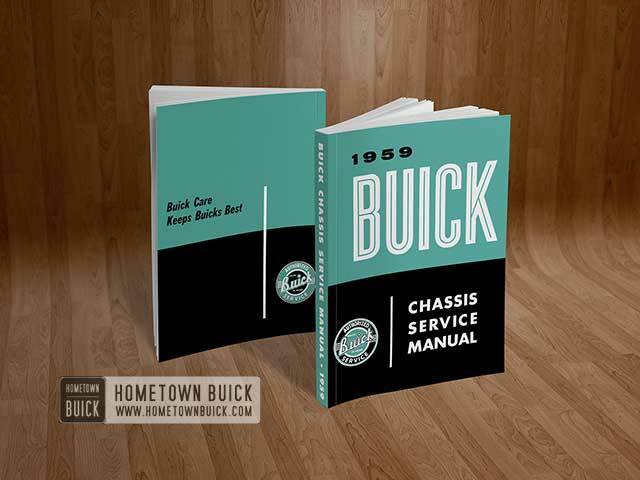 If the 1959 Buick headlamps do not operate properly as explained above, the difficulty is more serious than can be corrected by adjustment and the tests in step 3 should be made to isolate the trouble. 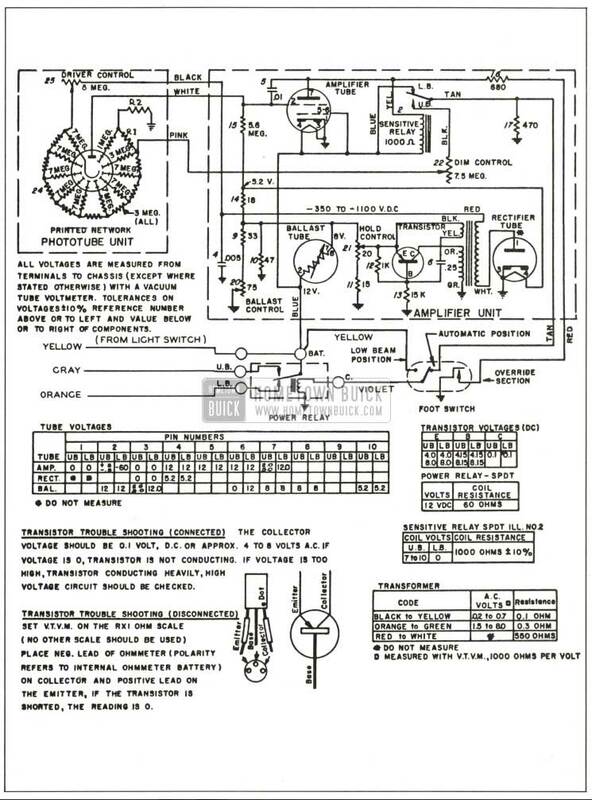 If the 1959 Buick Autronic-Eye did not operate properly when checked-out in step 2 above, the following tests should be made to isolate the trouble to either the power relay, the foot switch, or the electronic circuit. To test both power relay and foot switch, turn headlamps on and operate foot switch. If headlamps switch between upper and lower beam, power relay and main section of foot switch are okay. Next check all wiring and connections. If wiring is okay, trouble is narrowed down to the phototube or amplifier. See subpar. e.
If headlamps remain on either upper or lower beam when foot switch is operated, test power relay and foot switch as described in subpars. b and c.
Make sure wires are properly connected. See figure 10-67. If 1959 Buick headlamps stay on lower beam, unplug double connector from relay-headlamps should switch to upper beam. If 1959 Buick headlamps stay on upper beam, unplug double connector from relay and connect “BAT” terminal to “C” terminal with a suitable jumper – headlamps should switch to lower beam. If power relay will not operate as described, relay is defective and should be replaced. Remove 3 screws holding dimmer switch mounting plate to toe pan and make sure wires are properly connected. See figure 10-66. Remove triple connector from foot switch. Depress locking tang on tan wire terminal and remove tan wire from foot switch connector. Replace connector-headlamps should switch between upper and lower beam when foot switch is operated. With foot switch in position where headlamps are on upper beam, connect jumper between yellow wire terminal of foot switch and vacant tan wire terminal-headlamps should switch to lower beam. If foot switch will not operate as described, switch is defective and should be replaced. To test override section of foot switch when headlamps will not flash to upper beam, pull single red wire connector from foot switch, insert a paper clip in end of connector, and ground red wire. If headlamps now flash to upper beam, this proves that the override circuit is okay up to the foot switch. Therefore the foot switch must be defective and should be replaced. Amplifier and Phototube. If trouble was not in the power relay or in the foot switch, next make sure all wires are properly connected. See figure 10-56 and 10-66. If the Autronic-Eye still will not respond to the operational checks as described in step 2 above, the trouble must be in the amplifier or phototube. These two units should therefore be removed and sent to an authorized Autronic-Eye repair station. The 1959 Buick headlamps will convert to manual foot switch operation whenever the blue wire is pulled apart at the amplifier connection. Therefore, if amplifier is removed for servicing, nothing further need be done to insure manual headlamp operation. CAUTION: The blue wire is “hot,” so its terminal must be taped to prevent direct grounding. There are four adjustments which must be correct for proper operation of the 1959 Buick Autronic Eye phototube horizontal aim and vertical aim, amplifier hold sensitivity and dim sensitivity. Since any one of these adjustments could be a contributing factor to a complaint, all the adjustments should be checked in sequence and, if out of limits, corrected. CAUTION: The 1959 Buick Autronic-Eye develops a high voltage. Always turn headlamps off before removing cover from phototube. Installing Test Lamp and Aiming Device. The test lamp is a very accurate source of light which is connected to a test instrument. The test instrument has a rheostat to adjust the test light intensity and a meter to accurately read that light intensity. To install the test lamp, remove the phototube cover and insert from the front. An adaptor ring fits into the lens slot with a locator notch down to accurately locate the test lamp. See figure 10-58. The aiming device consists of a special phototube cover with an adjustable level and two sights. The level is set with a dial to compensate for the varying calibration in the optics of each phototube. It is used to aim the phototube vertically. The two sights are used to aim the phototube horizontally. To install the aiming device, set it on the phototube base in place of the regular cover. Pull out slightly on the driver control knob so the aiming device will seat fully on the phototube base. Replace screws and tighten securely. See Figure 10-59. NOTE : The aiming device contains a special plastic filter. This filter should be kept free of dust. lf the filter is damaged, the aiming device must be returned to the tester manufacturer for repair. This filter does not replace the amber filter in the phototube which must be left in place. Locate car approximately 25 feet from a vertical wall or screen. See figure 10-60. Sight along the car hood and place a piece of tape vertically on the wall at hood height to represent the car centerline. Measure distance in car between car centerline and phototube centerline. Place a second piece of tape vertically on the wall this distance to left of first tape. Sights on aiming device should line up with the left tape. If horizontal aim is incorrect, loosen small Allen screw in left side of phototube bracket using Allen wrench located inside tester cover. Rotate phototube until aim is correct. Tighten Allen screw and recheck horizontal aim. Vertical Aim. The phototube must be accurately aimed vertically. If the phototube is aimed too low, back reflections from the car’s own headlamps will cause it to hold the headlamps on the lower beam. On the other hand, if the phototube is aimed too high, it may not respond to the headlamps of approaching cars and may hold the headlamps on the upper beam when the car is heavily loaded. Phototube vertical aiming should be done with car at normal road trim height; that is, car unloaded except for person in driver’s seat, trunk empty except for spare, gas tank at least half full, and with tires at correct pressure. Locate car on a level floor (level within 1/4″ fore and aft of car). Rock car sideways to equalize springs. (d) Observe number stamped on name plate on bottom side of the phototube. See figure 10-61. Adjust aimer level dial until corresponding number is under pointer. Use Allen wrench located inside tester cover and adjust vertical aiming screw located in rear edge of phototube bracket until bubble is centered in the level. Hold Sensitivity. This is a test to see how low the light intensity at the phototube will go before the headlamps fail to “hold” on the lower beam and switch to the upper beam. Make sure test lamp is properly installed (step 1 above) and that tester intensity rheostat is turned off full counterclockwise. Place driver sensitivity adjustment on phototube in detent position (knob pointer straight up). Cover phototube with a heavy cloth during all tests and adjustments to prevent any possibility of outside light leaking into the phototube. Start engine and set carburetor on high step of fast idle cam. This is necessary so that normal operating voltage will be present in the Autronic-Eye for all sensitivity tests and adjustments. Turn headlamps on and wait at least 5 minutes for amplifier to stabilize. Set foot switch in automatic position (upper beam indicator on). Turn zero corrector on face of meter until meter pointer is on zero set line. Insert tester connecter into 1959 Buick cigar lighter receptacle (Sun Tester only). Turn “DIM-HOLD” switch to “DIM” position. NOTE: Sun Tester provides different selector switch positions for clear or tinted windshields; Kent-Moore Tester provides different meter scales for clear or tinted windshields. See Figure 10-62. Turn tester intensity rheostat full clockwise to obtain lower beam. If lower beam cannot be obtained, the amplifier dim control must be turned completely clockwise and then readjusted later under “Dim Sensitivity” below. Turn “DIM-HOLD” switch to “HOLD” position. Slowly turn tester intensity rheostat counterclockwise (reducing intensity of test light) just to the point where headlamps switch to upper beam. The meter pointer should now read in the “HOLD” bar. See Figure 10-63. If it does, go on to the dim sensitivity test; if not, adjust the hold sensitivity as described in the following steps. Remove two button plugs from front door hinge pillar. The amplifier hold control is available through the lower hole. Using a small screwdriver, rotate the hold control completely clockwise. Rotate tester intensity rheostat all the way clockwise. Turn “DIM-HOLD” switch momentarily to “DIM” position to switch lights to lower beam; then switch back to “HOLD” position. NOTE: If 1959 Buick headlamps fail to go to lower beam, turn amplifier dim control clockwise. Adjust tester intensity rheostat until meter pointer is at right-hand edge of “Hold” bar. Turn amplifier hold control slowly counterclockwise just to the point where headlamps switch to upper beam. See Figure 10-64. Rotate tester intensity rheostat all the way clockwise, turn “DIM-HOLD” switch momentarily to “DIM” position then back to “HOLD” position to obtain lower beam. Turn tester intensity rheostat slowly counterclockwise just to point where headlamps switch to upper beam. Meter pointer should now read in “HOLD” bar. If not, repeat procedure starting with step k.
Dim Sensitivity. This is a test to see how high the light intensity at the phototube will go before the headlamps “dim” from the upper beam to the lower beam. NOTE : Dim sensitivity should not be adjusted until after hold sensitivity is properly adjusted. Rotate tester intensity rheostat completely counterclockwise. Turn “DIM-HOLD” switch to “HOLD” position and then back to “DIM” position. Headlamps should be on upper beam. Turn tester intensity rheostat slowly clockwise (increasing intensity of test light) just to point where headlamps switch to lower beam. Meter pointer should read within the “DIM” adjustment line. See Figure 10-65. If adjustment is correct, proceed to step j. If not, adjust dim sensitivity as described in the following steps. Rotate amplifier dim control (upper hole) completely counterclockwise. Momentarily turn tester off then back to “DIM” position. Adjust tester intensity rheostat until meter pointer reads in the right-hand edge of the “DIM” adjustment line. Slowly rotate amplifier dim control clockwise just to the point where headlamps switch to lower beam. Do not go beyond this setting. Turn tester intensity rheostat completely counterclockwise then momentarily turn tester off and then back to “DIM” position. Rotate tester intensity rheostat slowly clockwise just to the point where headlamps switch to lower beam. Meter pointer should read within the “DIM” adjustment line. If not, repeat steps d through i. 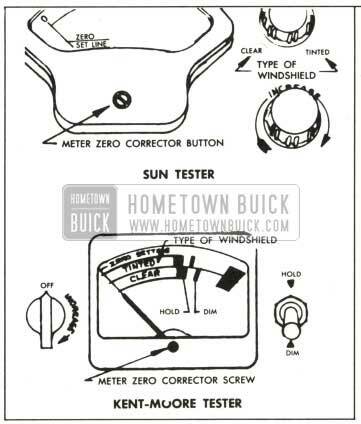 If adjustment is correct, turn off headlamps and disconnect tester from 1959 Buick cigar lighter receptacle (Sun Tester only) or turn Kent Moore tester off to keep batteries from discharging. Remove test lamp and aiming device from the phototube. Replace lens, cover and screws. NOTE: See paragraph 10-5 for lamp bulb and fuse specifications. Each 1959 Buick front parking and signal lamp contains one 32-4 CP lamp bulb which provides a 4 CP parking light and a separate 32 CP direction signal light. The pins on lamp bulb and slots in socket are offset to prevent improper installation of bulb in socket. The 1959 Buick parking light is controlled by the lighting switch and the circuit is protected by the switch thermo circuit breaker. The 1959 Buick direction signal light is separately controlled by the signal switch and the circuit is protected by the “DIR. SIGNAL” fuse on the fuse block under the cowl. The lamp bulb is serviced by raising the hood and removing the snap-out socket from the rear of the lamp assembly. Each rear lamp assembly contains a 32-4 CP bulb which is used as a combination tail, stop, and direction signal light. The 1959 Buick tail lights are controlled by the lighting switch and the circuit is protected by the 10 ampere “TAIL LTS.” fuse on the fuse block. The 1959 Buick stop lights are controlled by a hydraulic switch mounted on the left frame side rail. The switch is closed by hydraulic pressure when the brakes are applied. The direction signal switch is in the circuit, so the 1959 Buick stop lights may be flashing or constant depending on the position of the switch. The direction signal and stop light circuit is protected by the 10 ampere “DIR. SIGNAL” fuse mounted on the fuse block under the cowl. The combination tail, stop, and directional signal lamp bulb sockets can be snapped out from inside the trunk compartment. Since the position of the bulb filaments is important in the rear lamps, these sockets have been provided with a tongue and groove index to insure correct positioning. When replacing 1959 Buick stop light switch have new switch ready to install as soon as old switch is removed from master cylinder to keep brake fluid loss to a minimum. Always fill master cylinder reservoir after new switch is installed. A rear license lamp is mounted in the bumper below the license plate to provide adequate lighting of the plate. The lamp contains one 3 CP lamp bulb which operates in conjunction with the 1959 Buick tail lights, and its circuit is also protected by the 10 ampere “TAIL LTS.” fuse on the fuse block. The lamp bulb may be replaced by removing the lens from the license lamp housing. 1959 Buick back-up lamps are standard equipment on Series 4800 cars and are optional on all other series. They are located in the lower bumper panel on all series. They contain 32 CP bulbs behind clear plastic lenses. On synchromesh transmission cars, the 1959 Buick backup light switch is mounted on the steering column jacket. This switch is actuated by a pin on the switch itself which projects through a slot into the jacket. A short arm on the transmission control shaft actuates this switch pin while in the reverse position only. Slotted mounting screw holes permit movement of the switch up and down the steering column jacket for proper locating. Se paragraph 10-31 (b) for adjusting procedure. 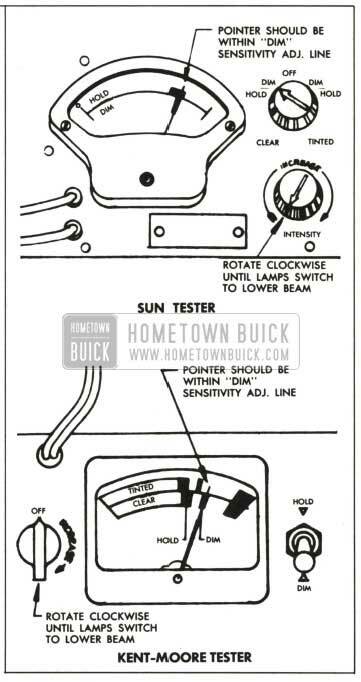 10-31 (a) for the adjusting procedure for the neutral safety and 1959 Buick back-up light switch. The back-up light circuit is protected by the 10 ampere “BACK-UP” fuse on the fuse block. 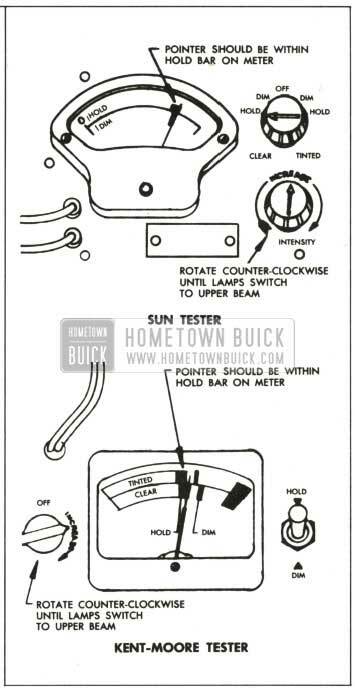 The s1959 Buick peedometer, gauges, light switch, heater defroster or air conditioner control, and clock are illuminated by lamp bulbs mounted on forward side of instrument panel to provide indirect lighting. The 1959 Buick instrument panel lights are controlled by the lighting switch as described in paragraph 10-47 and the circuits are protected by the 5 ampere “INST. LTS.” fuse on the fuse block. The instrument panel compartment (glove box) is lighted by a lamp bulb mounted in a socket in the upper corner of the glove box. The switch is mounted separately in the door opening. This spring-loaded switch makes contact when the compartment door is opened. As the door is closed it depresses the switch button to break contact and turn the light off. This circuit is protected along with the 1959 Buick map light circuit by the 5 ampere “MAP-GLV.” fuse on the fuse block. The 1959 Buick parking brake release warning signal, when installed, will show a red warning signal light on the instrument panel whenever the ignition switch is turned on while the parkin3 brake is applied. The signal lamp is controlled by a switch mounted in position to be operated by the parking brake lever. The circuit is protected by the 5 ampere “BK. & BZ.” fuse on the fuse block under cowl. When brake lever is in fully released position, the signal switch plunger must be depressed 3/16″ to open. the circuit. Adjustment is made by loosening the mounting screws and shifting the switch as permitted by the slotted screw holes. The 1959 Buick direction signal indicator consists of a 1 CP bulb mounted at each end of the instrument cluster. To gain access to an indicator bulb, the escutcheon must first be removed. Remove escutcheon by gripping it with a section of heater hose and turning it counterclockwise. Bulb can then be removed by depressing and turning counterclockwise. See paragraph 10-54 for a complete description. The control dial is illuminated by a 2 CP lamp bulb mounted in the control dial housing to provide indirect lighting. The light intensity is controlled by the lighting switch in the same manner as all 1959 Buick instrument panel lights. To replace the lamp bulb, drop the lower right instrument panel housing by removing the five mounting screws. Remove the snap-out socket which is located in the upper right side of the control dial housing. The Casco cigar lighter is heated by pressing the knob in until it latches; the knob will automatically unlatch and return to “off” position when heated to proper temperature. A replaceable thermal fuse which is screwed into the lighter base protects the lighter element against overheating if knob is manually held in for too long a period. The lighter is equipped with an ash guard, to prevent ashes and loose tobacco from falling on the users clothing and to permit the lighter to be passed around without danger of burning the fingers.